I was moved by a deep connection I felt with your work. Glass Castles drew me in from the moment I viewed it, resonating with the little black girl in me. Youth was a time when I felt joyful, imaginative, full of life, and positive. I can see myself in your work. For this reason and many more, thank you, Deborah Roberts. You have provided a platform to black girls who are often viewed as unworthy of being recognized in this way. When speaking about your work, you have proclaimed, “I want you to have an intimate relation with these girls [ … ] To see them, because there’s no place to look away.”(1) I am thankful that you challenge societal norms and stereotypes that have been harmful to black girls, and you have taken a bold stance against the sexism, racism, and gender bias endured by black and brown girls. I have internalized those norms and stereotypes and the limitations caused by them. Writing this letter has been liberating. Looking at Glass Castles, I chose to abandon that internalized oppression and become completely vulnerable. Your use of body parts and images pieced together is fascinating. The collage offers a glimpse of the complexity of what it means to be a black girl. I was especially struck by the eye in Glass Castles. The girl appears to be in profile, but the eye is always looking forward. I wondered if it was meant to represent the girl’s eye or someone else’s. Perhaps it represents the lens that boxes in black girls. The eye also reminded me of the phrase “white gaze” and the ways in which black women have been “othered” to justify mistreatment. In your artist statement, you say, “otherness has been at the center of my consciousness.”(2) Your work challenges stereotypes about beauty and creates a platform for the voiceless to be heard. Additionally, you have proclaimed, “the girls who populate my work, while subject to societal pressures and projected images, are still unfixed in their identity.”(3) This is such a powerful statement. In a world that views us as “other,” your work paints a positive narrative for black girls and women. The boxing glove pushes back against the often negative connotation of strength when attributed to black women. It could represent the reclaiming of an image meant to harm. The image of a literal glass castle is so jarring; it feels invasive. No matter the angle, you are constantly visible to the outside world, creating an unimaginable vulnerability. The film by a similar name, The Glass Castle, posits, “people [ … ] have the right to stone their own homes in order to be free.”(4) In essence, you have created a sense of freedom. You have allowed black girls the opportunity to envision themselves without the boundaries put on them by the dominant culture. You have unapologetically created work that shines a spotlight on black girls’ experiences in the world. This is so empowering and may indeed have a lasting effect on how black girls in their formative years view themselves! It also helps me envision new ways to advocate and support. Glass Castles inspires me to continue doing work that supports girls and advocates for gender and racial equity. Deborah Roberts quoted in Siddhartha Mitter, “Deborah Roberts Conjures Black Girl Magic,” Village Voice, December 6, 2017, https://www.villagevoice.com/2017/12/06/deborah-roberts-conjures-black-girl-magic. Deborah Roberts, Artist Statement, http://www.deborahrobertsart.com/artist-statement. 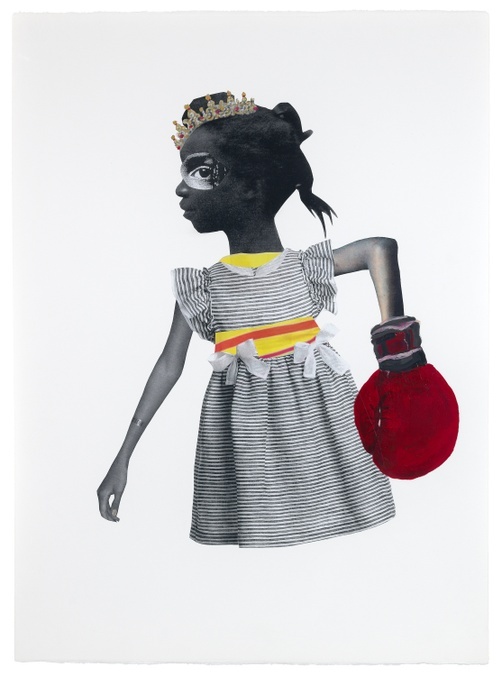 Deborah Roberts quoted in Antwaun Sargent, “The Artist Changing the Face of Black Girlhood,” Vice, March 6, 2018, https://www.vice.com/en_us/article/59kapb/the-artist-changing-the-face-of-black-girlhood. Helen Herimbi, “Stoning Their Own Glass Castle,” IOL, September 8, 2017, https://www.iol.co.za/entertainment/stoning-their-own-glass-castle-11136672. Latisha J. Barnett, Director for the Office of Student Diversity Programs at Skidmore College, earned her B.A. in sociology from the State University of New York College at Fredonia and her M.S. Ed. from the College of Saint Rose with a focus on college student services administration. She previously worked at the College of Saint Rose for 12 years, where she served as the assistant director of multicultural affairs for two years and then as the director of student life for 10 years. She also has experience teaching as an adjunct professor for the core course “Social and Cultural Foundations” in the College Student Services Administration master’s program at Saint Rose. She has also worked in nonprofit as a service coordinator advocating for the needs of individuals with disabilities. Originally published in Accelerate: Access & Inclusion at The Tang Teaching Museum 2 (2018). Barnett, Latisha J. “Deborah Roberts, Glass Castles, 2017.” Tang Teaching Museum collections website. (https://tang.skidmore.edu/collection/explore/44-deborah-roberts).